He’s Holding The Whole Thing! 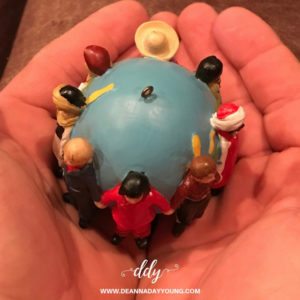 “He’s got the whole world in His hands. I woke up singing this song and couldn’t get it out of my head. Why did I wake up singing this song? Is it because I feel like I have the whole world on my shoulders? That’s my own fault. I am no more in control of the things of this world as I am how much snow we get this winter. But I know the One who is and He’s got the whole entire thing in His hands. He’s got the gal who just heard the cancer diagnosis. He’s got the baby who can’t stop crying from unsolicited drug addiction. He’s got the guy who is in rehab wanting to do it right this time. He’s got the family who lost their home to fire. He’s got the momma who doesn’t know where the next meal will come from. He’s got the wife who is running for safety from the abuser. He’s got the one who seems to have it all together on the outside but is falling apart on the inside. He’s got the preacher and the teacher and the engineer and the doctor and the nurse and the stay-at-home mom and the unemployed and the rich and the famous and the poor and the weak. Give Him yours so you can rest. 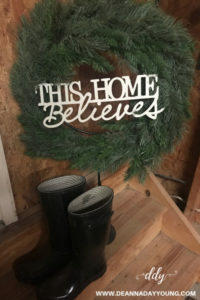 This entry was posted in devotional, inspirational, motivational, spiritual on November 26, 2018 by Deanna Young. Things you want to do “before you kick the bucket”? Things you want to do before a certain age? Things you want to do while in a certain location? The answer to me is: all of the above. I love writing down goals and working towards accomplishing them. 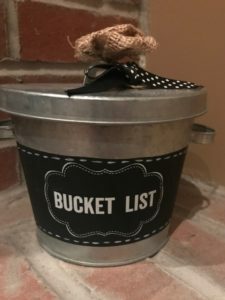 My bucket list is just a list of things that I want to do that are far enough out of reach that I have to work for them but close enough that I can accomplish them by putting forth some effort. A bucket list, to me, resonates HOPE. Things that I will enjoy working towards. I watched the movie, The Bucket List, last night. It stars Jack Nicholson and Morgan Freeman. Two polar-opposite terminal cancer patients who create a bucket list and set out to accomplish them, together, before they leave this earth. And although there are many tears in the movie, the moral of the story is what draws me in every time. (Not to mention they show the Hill-Rom hospital bed logo many times – for which I am responsible to maintain in my every day work life 🙂 ). What are the lessons I learned from The Bucket List? 1. Love while you can. 2. Forgive – life’s too short to stay mad. 5. Travel and see something you have always wanted to see. 6. Do something you are scared to do. 9. Money can’t buy happiness. Do you have a bucket list? Things you would love to accomplish that will allow you to enjoy the journey as well as the summit? Start small but love the life God has given you to live. I’m enjoying one of my bucket list items as I write…..and thank YOU FOR reading it! This entry was posted in devotional, inspirational, motivational, spiritual on November 21, 2018 by Deanna Young. Have you ever been mad at something or someone but when you calm down you realize it wasn’t really them you were mad at but you took it out on them? Let me explain – like when you’re at the BMV and you don’t have the right papers required to get your new license, you get mad at the lady waiting on you. That’s really not her fault but rather the higher agency that set the rules. Or your meal comes out overcooked at the restaurant and you don’t leave the waitress a tip. The waitress didn’t cook the food. It’s probably not her fault but rather the cook in the kitchen. We have to remember not to misplace anger in other areas of our lives when people act out in evil ways. We have a big duty to fight against the devil and the evils in the spiritual realm rather than the physical people doing the acting out. The devil is crafty and this world’s crazy. We need to be on our knees praying against the devil’s wicked schemes every day and putting on our own armor so he can’t get at us. 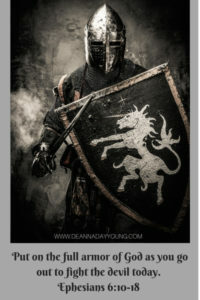 Read Ephesians 6:10-18 to find out how we should dress each day to fight the real enemy. He will not win because I’ve read the end of the Book…Jesus and his followers win! This entry was posted in devotional, inspirational, motivational, spiritual on November 18, 2018 by Deanna Young.